Photo: Pastor Sam/ CC BY 3.0. A preferred route for Dublin’s €3 billion Metrolink line, which will run north-south through the city, has been announced. The National Transport Authority (NTA) and Transport Infrastructure Ireland (TII) have published a detailed proposal document for the project which includes an “Emerging Preferred Route” for the new metro service. The 26km line connects Estuary north of Swords to Sandyford on Dublin’s southside, with stations in the city centre and at Dublin Airport. The proposed route is subject to a public consultation but the NTA has said it hopes to open the line in 2027. 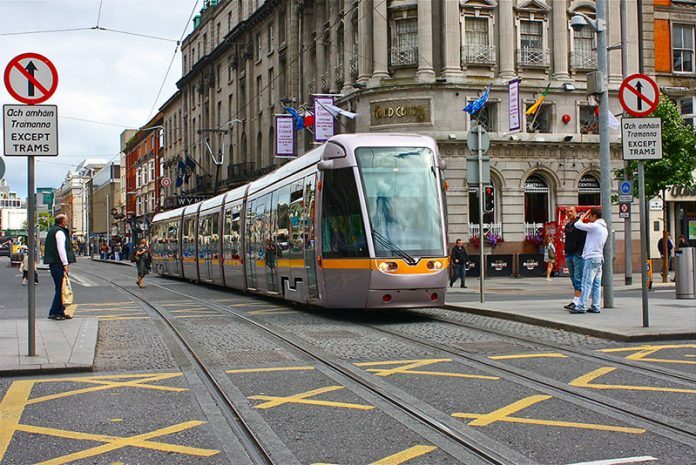 The line will serve 25 stations, including 15 brand new stations, and would involve upgrading the existing Luas Green Line to a metro service, connecting up to the metro operating north to the airport. The preferred route is based on a twin-bore tunnel design but NTA said a single tunnel option was also being considered. The new service will operate 30 trains per hour in each direction. Its construction, which is scheduled to start in 2021, is expected to create around 4,000 jobs. NTA chief executive Anne Graham said: “There are very significant benefits associated with MetroLink, particularly in terms of the integrated transport system that it will bring about for Dublin. She added: “We have modelled future passenger numbers and we predict that capacity for 15,000 passengers per direction per hour during the busiest peak times will be required along this corridor.